This roof air-water heat exchanger, PWD, with a IP 55 protection degree, is ideal for dusty environments with high temperatures. Air cleanliness and the temperature around the enclosure will not affect the heat exchanger's performance. Floor standing enclosures may be cooled independently, if needed, which reduces energy consumption. The heat exchanger is placed on top of the enclosure, which means cooling can be provided also when there is not enough space on the door or side panels. For roof installation. Additional work is not required to the cutout to guarantee the IP. Integrated thermostat and solenoid valve for temperature control. The thermostat is adjustable between 8 °C and 50 °C, factory setting 35 °C. Maximum permissible operating pressure of 10 bar. The cooling capacity for specific conditions are indicated in the diagrams. 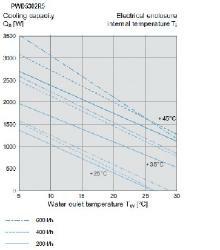 Water inlet temperature between 1 °C to 35 °C. 3.5 m cable 3 × 0.75 mm² for electrical connection. 13 mm hose nozzle for water pipe connections. Housing manufactured from galvanized steel, powder coated. Heat exchanger manufactured from copper pipe, with aluminium fins. +1 °C to +70 °C. IP 55 towards the electrical enclosure. Roof Air-Water heat exchanger with a IP 55 protection degree. The heat exchanger provides cooling without using the air immediately around the enclosure. Cooling can be provided to enclosure's that do not have enough space on the door or side panels whether standalone or as part of an enclosure assembly. The air cleanliness and temperature immediately around the enclosure will not affect the performance of the heat exchanger, making it a good solution for dusty environments with high temperatures. Floor standing enclosures can be cooled independently of each other, if required. This avoids cooling the entire enclosure assembly, reducing the amount of energy required, saving unnecessary costs.